Get the know-how to build a deck with steps and railing. Before buying tools, timber and materials, read every step thoroughly then talk to your Home Timber and Hardware expert. Position is important, your deck should be practical and where possible make the most of the sun. With careful consideration you may not have to clear plants, bushes or trees and by avoiding drains, external pipes and plumbing, you will make the project even simpler. 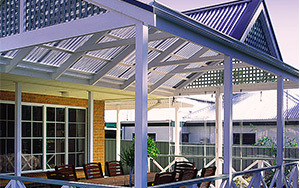 Check permit requirements and suitability of the deck location with your Council. Also check safety requirements for steps and railings. Home Timber and Hardware carry a comprehensive range of durable timbers that will compliment any home, and as your deck will be exposed to sun, rain, wear and tear the use of correct timber will ensure long life. You will need a hand or power saw, chisel, measuring tape, screwdriver, electric drill and bits, spanners or adjustable wrench, hammer, wood or metal stakes, spirit level, builder’s line, square and a shovel. Take your scale plan to your local Home Timber and Hardware expert, where the friendly staff will advise you on timber lengths to minimise off-cuts and materials such as: dry or pre-mixed concrete, stain or paint, structural timber fasteners, universal trip’l grip, strap nail, tylok plates, masonry anchors, timbers, galvanised screws and decking nails. Site preparation is important, poor drainage must be avoided as it leads to footing problems and water accumulation. Further undergrowth can be minimised by laying plastic sheeting or weed mat and covering with crushed rock or pine bark. Both are aesthetically pleasing. Place marks on house wall at each end, then using masonry nails, a string line and spirit level, check for level. Cut the ledger to length and lift into position. Drill into the house wall and bolt to the masonry. Check the ledger height, level and position and then secure with the remaining bolts. Run a string line along the side of the house and out to past the intended depth of the deck and secure to a stake. Then place a timber onto the ledger and support the other end with a temporary post at the distance of the corner post (C). Check that distances (A) and (B) are equal and that the timber is level and temporary post is plumb. Place a peg in the ground at the location of the corner and any inter-mediate posts and remove the timbers and dig the holes. Repeat the procedure for the length of the deck (Fig 2). Dig all post holes to the required specifications and mix and place a concrete footing in the bottom of each hole (Fig 3). Allow the footing to cure before proceeding. Repeating the procedure in Step 8, measure from the bottom of the horizontal timber to the footing. Add this measurement to the distance the posts will go above the bearer (deck thickness, railings etc.) and cut the post to length. Then measure down the post and notch out a section to support the bearer. Stand the post in the hole and brace while checking plumb with a spirit level. 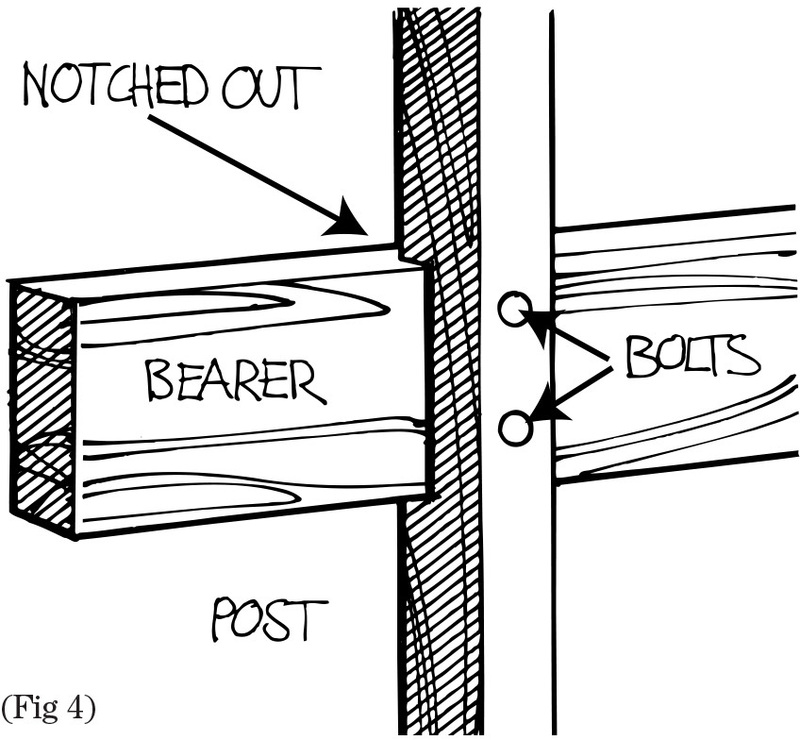 Cut the bearer to length, locate it in the notched section of the post (Fig 4) and temporarily clamp it into place. Then drill through the bearer and post. Bolt the bearer to the post and check height and level using a spirit level. Cut the floor joists to length and place the first on both ledger and bearer. 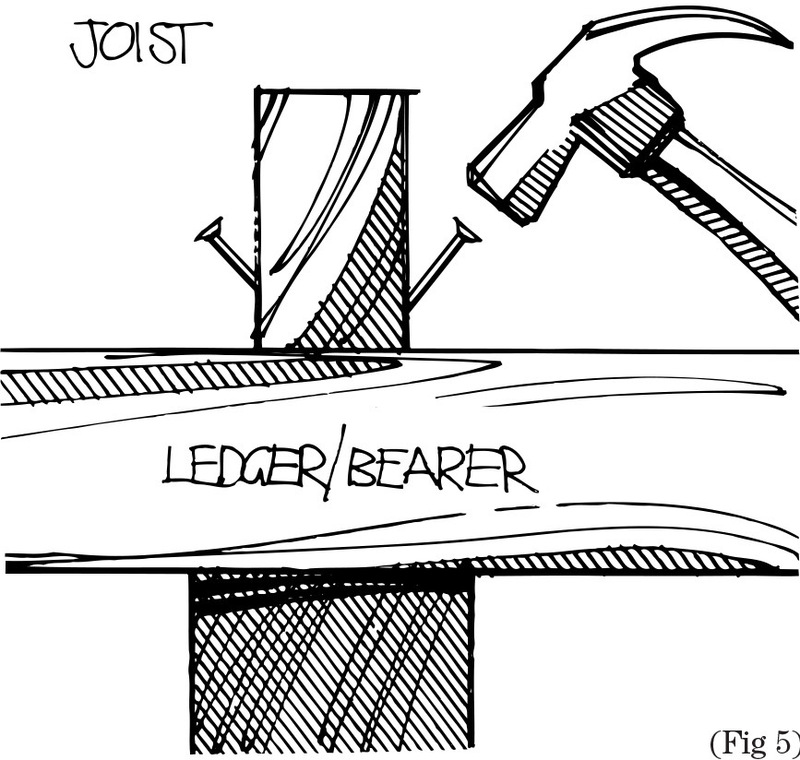 Starting at the ledger end, skew nailing through both sides of the joist (Fig 5). Check that the structure is square and place a spirit level on the joist to check there is no fall before fixing the remaining joists. Finally fit the metal brackets. Fix the post holes by compacting a dry concrete mix 50mm at a time (Fig 4). 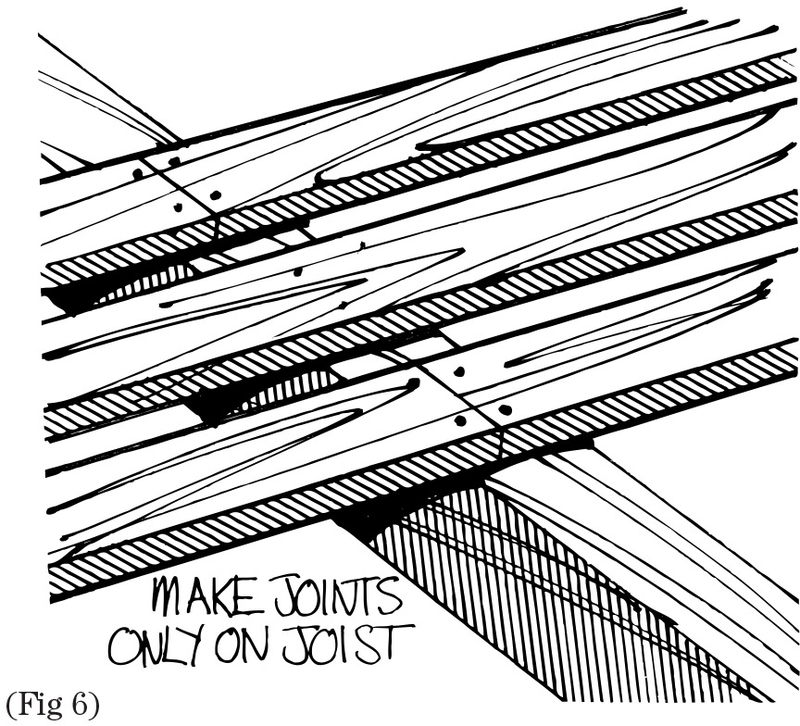 Start laying the deck from the house and working outward, fixing with two nails at each joist. 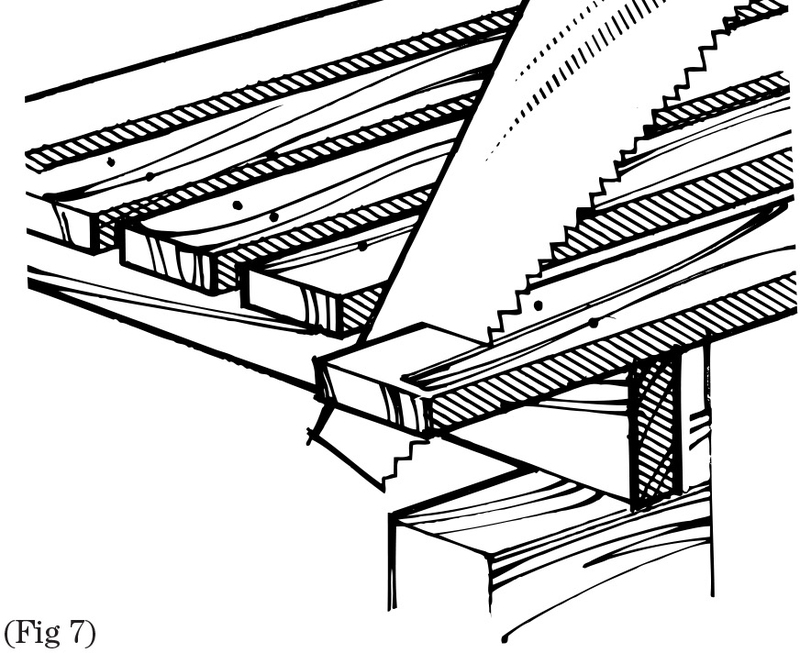 Boards should only abut at joists (Fig 6) and ends should have a slight overhang to permit trimming, producing a clean finish to the deck (Fig 7). Cut stringers to length, then cut each end to the appropriate angle and using an adjustable set square, mark the locations of the cleats. Then nail the cleats to the stringers (Fig 1). 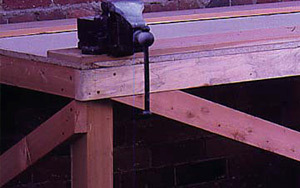 Fix the stringer foot brackets to the foundation and place and bolt both the stringers to the deck and then the brackets. Finally fit the stair treads, skew nailing into both cleats and stringers (Fig 1). If using railings, cut them to length, clamp into position and drill and bolt to the posts. Then mark the position of the uprights and screw them to each railing (Fig 1). If you intend to use anin-fill style of railing, cut the bottom channel to length and fit it between the two posts, then fit the post channel sections. Next cut the in-fill to size and sit it into the channel and place the top channel onto it and secure the posts (Fig 1). Remove all temporary braces, string lines and stakes. 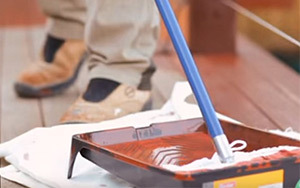 Sand where necessary and give any stained or painted surfaces a second coat.